It's been a good week of reading. 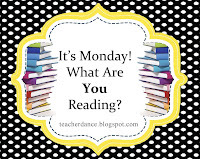 I finished Red by Liesl Shurtliff and started Home of The Brave by Katherine Applegate, strongly suggested by Ramona, a good friend and reader. And I'm nearly finished with Isabel Allende's The Japanese Lover, enjoying this adult book very much. Here's my review on Goodreads of a poetry book you need to know about, out for the last election, and so wonderful for this year, too. 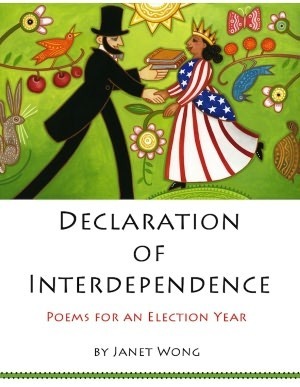 The Declaration of Interdependence: Poems for An Election Year by Janet Wong is filled with poems you can use to teach history, to discuss current events, to enjoy the entertainment value of them, too. Thanks to NetGalley for this advance copy of Red- out in April! I couldn’t help but think of the word “family reunion” as I read this new tale by Liesl Shurtliff. There are new things to learn about Red Riding Hood, but there also are reminders of her past adventures with Rump, good memories touched on. 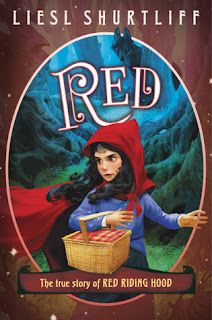 Red has inherited the strength of magic from her Granny, but early in the book we learn that Red stays away from it because of disasters that happened in her young life. Once she tried a small spell or two, which never worked, and one nearly became the end of Granny. To Red’s dismay, one day she arrives to find Granny in bed, very ill, and sends Red off to find the ingredients for a strong medicine. The ingredients are not all found, and Red’s path turns to a new idea: she begins to look for the spells that would mean eternal life so that Granny would never die. This leads to an adventure with dwarves, being followed by a wolf and a hunter, and conflicting experiences with a beast. There is also a new unwanted companion, the familiar one with blonde curls, Goldie. Goldie’s on a search too, and that porridge-loving girl we all love is both an irritant and a help to Red. Does this sound complicated? It is, wonderfully. I was surprised whenever I rounded a corner with Red, worried when she was in danger, commiserated with her feelings, admired her courage and rooted for her success. I loved every bit. I have to admit I’ve never read any of Kate Messner’s Ranger In Time stories, and I won these two. Now I’m hooked. For time travel books for middle grade readers, these are terrific. Kate Messner moves the stories from today’s Ranger and family, into meeting the new setting with realistic people that need Ranger’s help. 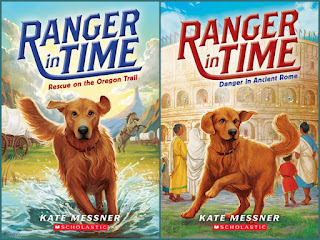 Adventures in time travel often show someone who is pulled back in time in order to save someone’s life, and Ranger makes a different kind of hero (dog, not human), but quite a wonderful one. Imaginative and fanciful about a fairy who leaves a kingdom after feeling unwanted. Bloom has “boots caked with mud. There was dirt between her teeth. Beetles rested in her wings.” It isn’t long before the kingdom begins falling apart, and the king and queen decide to send for Bloom, realizing she can help. They don’t understand Bloom’s approach to life, and dismiss her as disrespectful. Only until a young girl is sent do sparks fly and things get interesting. In my first reading with my six year old granddaughter, much explaining was needed. The message of the book, that each person is unique and to be loved, didn’t connect. But, she asked to read it again, and we had more conversation, and examined David Small’s beautiful and quirky illustrations more closely. Reading deeply does take time and support. I enjoyed the book, would suggest it as a read aloud with lots of questions and talk. This tale is told by a young girl, perhaps ten, about her grandmother and all the wonderful times they have when she visits the grandmother’s home in the woods. It covers the seasons’ blessings, including autumn, watching squirrels gather nuts and geese honking by on their way south. This grandmother is not the cookie-baking one we see most of the time, but an outdoors-loving one, the kind that the girl wants to be. I spent many parts of my summers with one beloved grandmother, roaming their farm, working in the garden, bringing up the cows and gathering blackberries for jam. This story and the relationship shared makes me want to go back in time, and I imagine it would be a great one for children to read, to wonder what it would be like to visit a grandparent in the woods. The illustrations are beautiful woodcuts, filling the pages with simple experiences in the woods. This is another wonderful tale of bear, goose and fox. In the story, bear laments that he cannot fly. The three do try, at least fox does, but goose stand apart, quite skeptical. I adore Bloom’s illustrations, and this time, we have the joy of seeing Bear dance. There are several other titles about these three adorable friends. Simple text, gorgeous illustrations for younger children. I can’t pass up a Kevin Henkes book, and this one is the expected simple story for young children, and filled with imagination. There is the usual garden, but with a bit of imagination, like growing buttons and seashells, the story itself grows. My youngest granddaughter and I had much fun deciding what we might grow in our own fanciful garden. Lovely sunflowers in blue fill the endpapers. This poetic story will help everyone--adults and children--calm down and relax, especially “when the world is spinning so fast. . .” Each can “sail on the sea.” And “go with the flow.” And finally end with the world “just the right size.” In the author’s note, Susan Verde talks of all kids being “yoga”, which means “union.” The yoga poses shown on each page in the light and airy art of Peter H. Reynolds are also explained in the back. Beautiful book. In lovely watercolor and collage, Wahl tells the story of Sonia’s chickens from chicks to hens. Sonia is so caring and responsible, loving taking care and glorying in the first brown egg. I love when she holds that egg to her cheek and says “thank you”. Sadly, a fox gets into the coop, and Sonia finds one of her beloved chickens gone. The explanation by her father tells about the needs of the fox for his own children, just as Sonia cares for her chickens, and he cares for his family. It doesn’t take away the sadness, but does help Sonia understand that all living things have needs to take care of. And there is a good surprise at the end. I imagine many good conversations about predators and prey in our world after reading this book. I know, it’s past Valentine’s Day, but this has become a beloved book at my house, read many times. Jaspar Bunny is out in the snow visiting neighbors, looking for the perfect Valentine for his wife, Lilly. On his way, he decides that knitting scarves (like the porcupine children) will not work for him, and chocolate-covered flies (like Miriam Frog has for her husband) are just not the right thing. Jaspar has quite an adventure exploring Teagan Fox’s ideas, too, but in the end, the gift is found. With gorgeous acrylic paintings with black outlining showing the animal families and the snowy out of doors, this is a wonderful Valentine’s love story with a happy surprise ending. Next: Still haven't chosen a "Must-Read in 2016" book, but it's time to do that. Hope you all have a great reading week! So many wonderful books here that I want to read! I think I'll try one of the Ranger books as a breakfast read-aloud with my son. He's usually open to books that are a bit on the young side or a bit different during breakfast (for bedtime reading, it's all fantasy series all the way!). I haven't read any of the many middle-grade time travel series that are out there, and I really ought to remedy that. The Ranger books sound interesting and fun. I did love Red--by far my favorite of Shurtliff's fractured fairy tales. Surprisingly moving at times as well. The Ranger books might be fun for you and your son, Elisabeth. They are simple, but include the setting well, and have some adventures. Yes, Red was great, sorry that I've heard it's the final one. Thanks! I love all things Little Red Riding Hood--and all fairy tales. I must find Leisl's series to read. The Declaration of Independence looks like a good companion to My America: A Poetry Atlas. Please try Rump, Kay. These tales by Liesl Shurtliff are quite good. Wow! 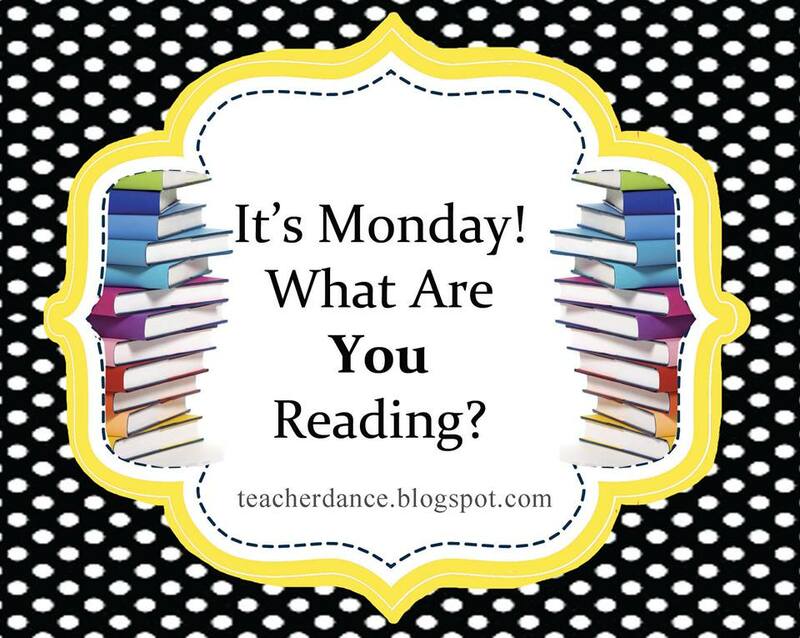 You did a ton of reading this week. We were excited to read your review of Bloom because we just got it from the library and after reading your review of Red we will order it too. 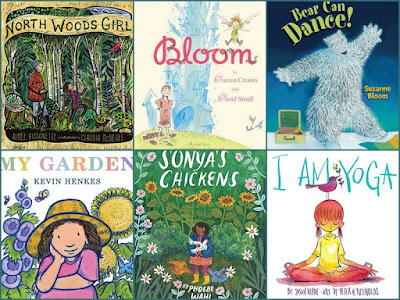 Thank you for sharing so many wonderful titles with us. You're welcome. Some of these are read because the granddaughters come to visit, and we read a lot! Hope you enjoy Red, and Bloom too, an interesting book. LInda - I loved Rump and had not heard of Red. Thanks so much for sharing - sounds wonderful! Lots of good books today! You were busy reading! Thanks, Joanne. I just added a thank you to Net Galley for an ARC of Red. It isn't out until April. Hope you found some pic books you might like, too. You certainly have been on a reading tear, Linda! I'm glad that you reviewed Kate's books - now I know that I should invest in them! You'll have to take a peek at them, Tara. They could be a little young for your students, but I enjoyed them very much. Red: The True Story of Little Red Riding Hood is awesome! I have lots of requests for it. I have several students who really enjoyed Rump & Jack: The True Story of Jack and the Beanstalk. I still need to read the Ranger in Time books. A lot of my students enjoy other time travel series like The Magic Tree House and Time Warp Trio. I wish I could get more time to read! 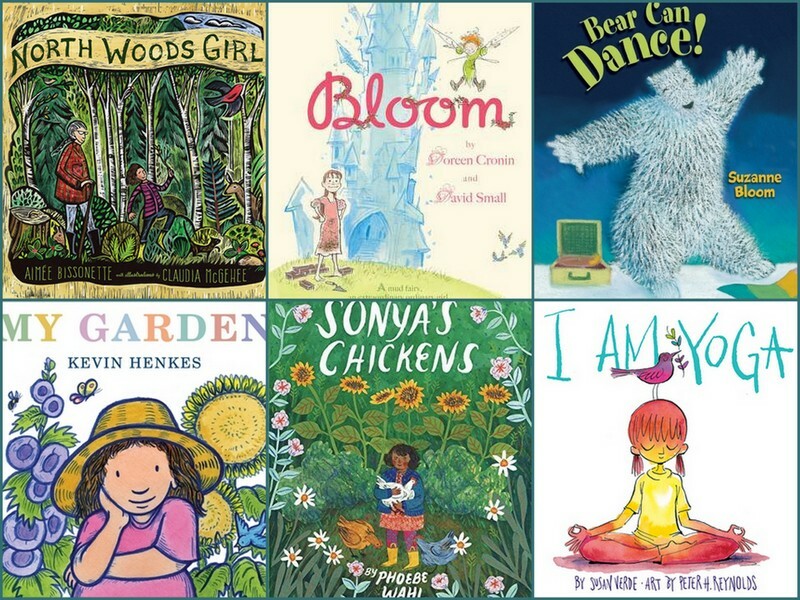 Looks like you've read some good picture books this week, too. I'm still waiting for Bloom from my library. Have a great week! We've been enjoying some spring like weather that makes me itchy for Spring Break! It seems like Spring Break time here, too, Jana. 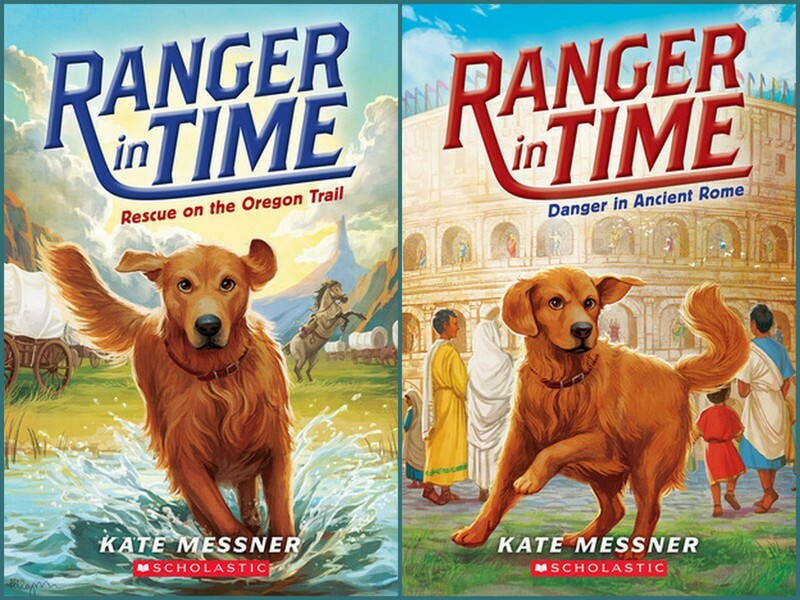 If they like the Magic Tree House, I think they'll love the Ranger In Time books, too. I'm not surprised that students love Rump, Jack & Red. They're great. I'll be interested to see what you think of Bloom. I have never read any of the Ranger books either. I just had a student ask me if I had any "dog books." These books sound entertaining while also offering something to learn. I'll have to read one! The books might fit very well, adventure with this lovely dog! They don't take long to read for adults, so try one, Lisa. I love Home of the Brave. I have had really great conversations with kids about culture while reading this one. I am looking forward to reading Red! Have a great reading week. Thanks Andrea, I'm enjoying it too, so glad that it was recommended. Love love LOVED I Am Yoga! You can see that I loved it, too, Beth. Glad to hear from you about it! It's a great book, Crystal, covers a broad range of "election" topics. Just think, it's only March, a long way to go till November. So many great books, where to even start?! The "Red" book kind of reminds me of the TV show "Once", where characters from different fairy tales interact. Sounds like a great series. It is a great group of books, just right alone, or as a study of different approaches of fairy tales. Thanks, Jane. 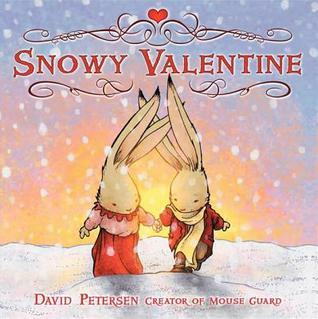 The Valentine book is very nicely done, beautiful illustrations. I hope you'll get to the Shurtliff books someday! Thanks, Myra. Ah, yes! We need more books about politics to get students involved in their government early. I am glad to see The Declaration of Interdependence: Poems for An Election Year. Even selections from the book might be fun to share--if a teacher doesn't have time for the full text! :) Thanks for sharing! Thanks, Ricki, the book is filled with good poems for numerous topics. I hope others will find and appreciate it as I have. I want to read Ranger in Time. I am a huge Kate Messner fan, but I have gotten behind! I've gotten behind too, Kellee, with other books, but am really glad I read these. Hope you like them, too.